Gosh, Ralph! Is there anything you can’t wreck? First, it was that big building in Fix-it Felix Jr. Then, you went on to smash up everything in Hero’s Duty. After that, you found your way into Sugar Rush and you smashed up stuff there. We don’t even want to know that damage that he did when he visited the Rootbeer Tapper game! Now, he’s headed to the Internet to cause some trouble? Well, he might be a lumbering big dude with a penchant for wrecking things, but the good news is that Wreck-It Ralph always has his heart in a good place. Most of the wrecking he does is in the name of friendship! 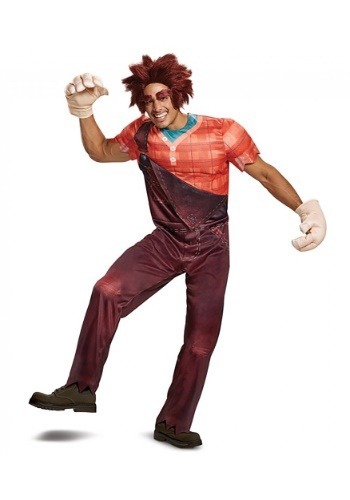 Now, you can be a beneficial kind of wrecker when you wear this officially licensed Disney costume. This Wreck-It Ralph 2 Costume comes from the movie Ralph Breaks the Internet. It comes with everything you need to become the iconic character. It comes with a jumpsuit that has muscle padding in the chest and shoulders. The top looks like Ralph’s plaid shirt, while the bottoms are designed to look like his brown overalls. It also comes with a pair of oversized gloves that make your hands look like the large smashing fists of Wreck-It Ralph. Finally, it comes with a brown wig that gives you Ralph’s messy hair and a pair of faux eyebrows to complete the transformation. When you wear this costume to your next costume party, you may feel a strong urge to do some wrecking. We strongly urge you to control this instinct. Your friends might not like it if you decide to smash the potato chip bowl with your hands! Be sure to check out our Vanellope Von Schweetz costume for a fun duo look from the movie.